Awards & Recognition - TTC wetranslate Ltd. 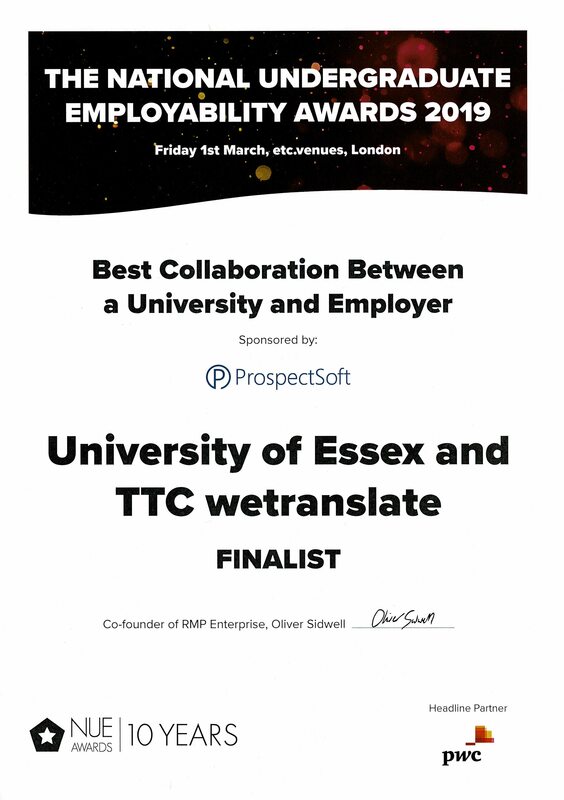 The collaboration shortlisted is the University of Essex Translation Challenge, an annual competition where Essex language and translation students get to test their skills on a real commission for a business in the region, in order to develop their CVs and gain real-world experience. Antony Cotterill, Senior Faculty Employability Manager for the Social Sciences, said: “Now in its fifth year, the Translation Challenge is a stellar example of a longstanding, effective and influential partnership between the Department of Language and Linguistics and TTC wetranslate, an award-winning local company. TTC wetranslate has been Essex’s partner in Translation Challenge since its inception in 2014. Speaking about the collaboration, Managing Director, Levent Yildizgoren, said: “Partnering with a major national institution such as the University of Essex has had a great impact on our business. “It has become increasingly apparent to me that industry and academic institutions need each other’s help and support.”. 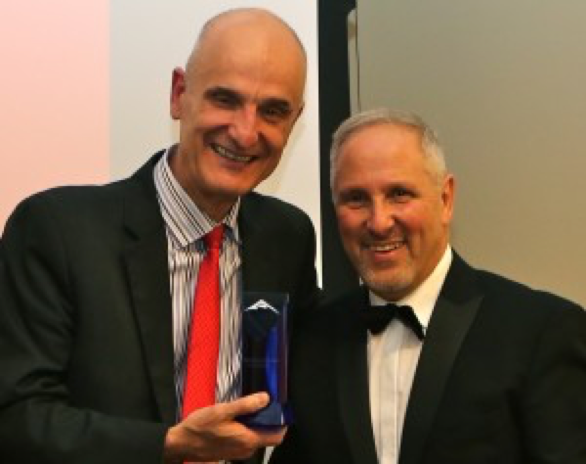 We’re very happy to announce that our Managing Director, Levent Yildizgoren, won an award in the “Outstanding Contribution to the Industry” category at the Language Industry Summit Awards on Thursday evening. The awards ceremony was held at the ATC Conference, from 24-25th September 2015, and all the key players from the global language industry were in attendance. 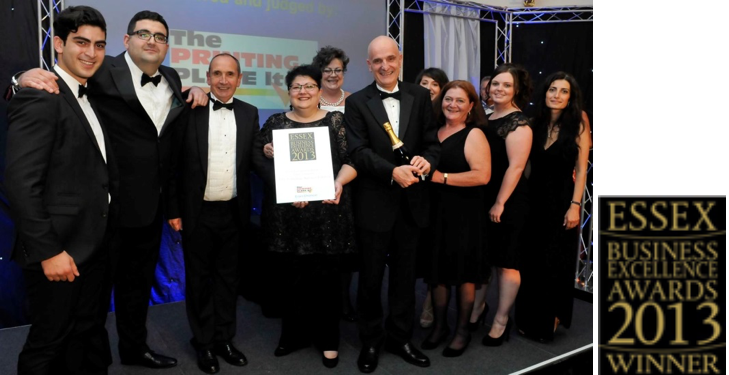 The idea behind the awards is to recognise and celebrate excellence in the profession. Levent has been working in the translation industry and running TTC wetranslate for over 20 years, and has overseen the growth of the company from a single language vendor, to a company which offers over 100 languages. He has always sought to innovate, and find new ways to please customers and grow the business, and while doing so has looked further than the business side of things, and forged close links with the University of Essex, Anglia Ruskin University and Hacettepe University in Ankara. Two years ago, Levent initiated the annual “Translation Challenge”, in which over 130 students from the University of Essex have the chance to translate for a real client, and gain valuable experience in the industry. Every year we work with new interns from universities across Europe, with the aim of raising new talent for the translation industry, and giving translation students experience in helping with live projects. Helping grow the industry by galvanising exciting new talent, and growing TTC into a key translation agency, is no easy task, and we’re very proud of Levent for being recognised for his efforts. 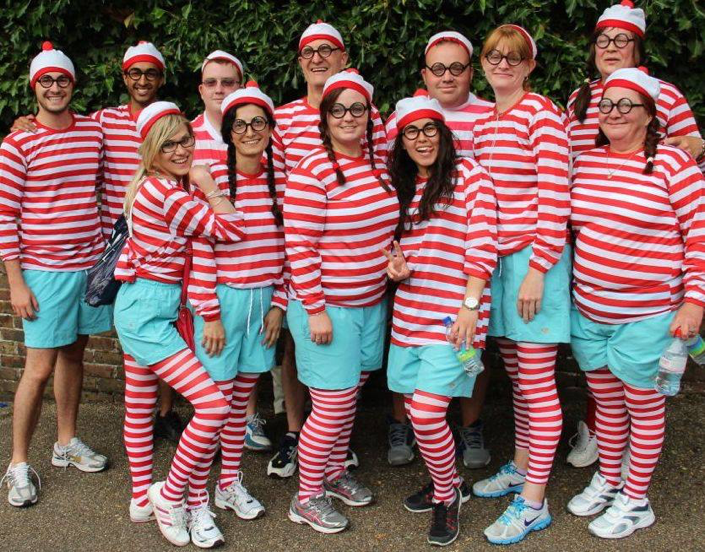 With great enthusiasm, the TTC Team took part in the Race4Business yesterday evening organised by Birketts llp in Chelmsford, Essex. 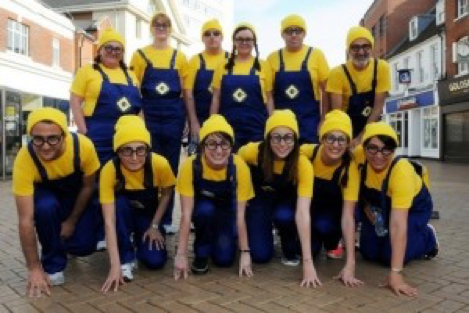 The event has been held annually in Chelmsford since 1998 and has raised nearly £500k for good causes. This year’s event raised funds for Age UK Essex, a charity which supports older residents. TTC are extremely proud to have been a part of this years Race4Business, just as we have been for the past 10 years! This year, TTC tried something different. 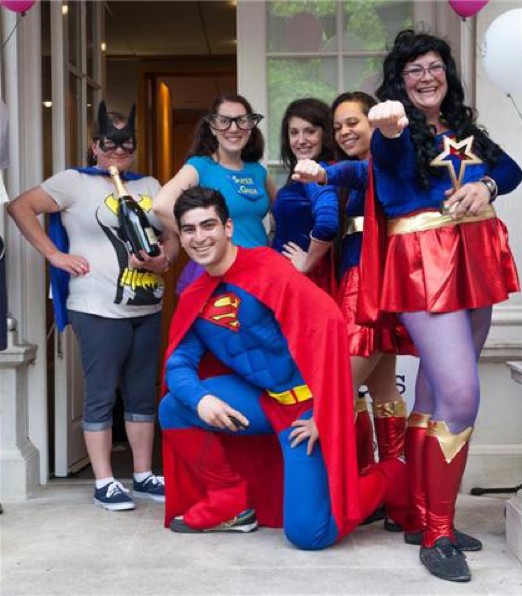 They added a superhero theme and dressed up in super outfits to compliment a super cause! As a result of their efforts, they won the “Best Dressed Team” award – which consisted of a wonderful looking trophy and a bottle of Moet champagne. 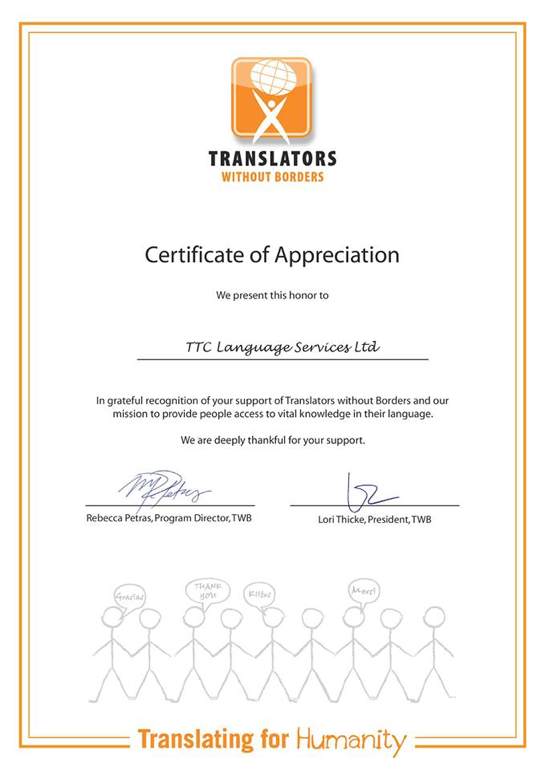 TTC have received certificate from Translators Without Borders! Translators Without Borders (TWB) are a non-profit organization who facilitates the transfer of knowledge from one language to another by creating and managing a community of NGOs who need translations and professional, vetted translators who volunteer their time to help. 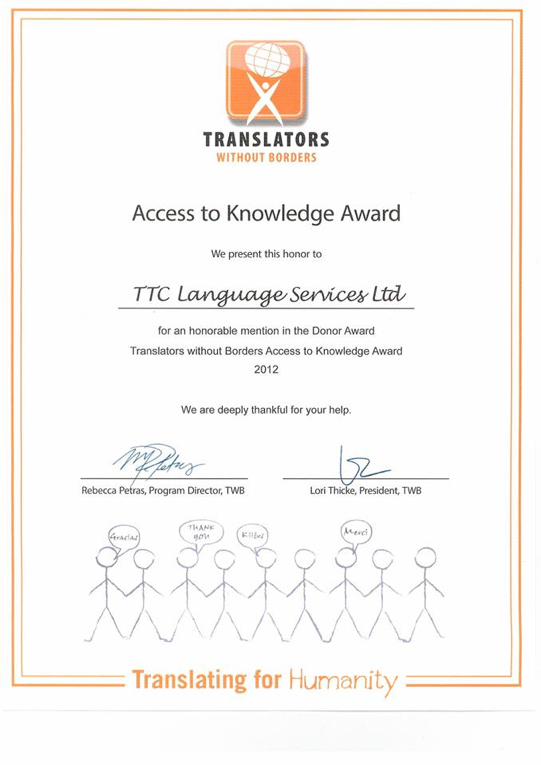 TTC have received Access to Knowledge Award from Translators Without Borders!